Born in October 1805 at York Factory, Canada, Kitty was the daughter of Thomas Umfreville and a Cree woman named Hannah Turner. Kitty was born into a prominent Hudson’s Bay Company family—her paternal grandfather was Edward Umfreville, an HBC trader, and her aunt Louise (Lisette) Umfreville married John Rowand, Chief Factor at Fort Edmonton and in charge of the HBC’s Saskatchewan District. Details of Kitty’s early life are unknown until she married Pierre Chrysologue Pambrun in a country marriage, or mariage à la façon du pays, on January 10, 1821 at Cumberland House in Saskatchewan. Their first son, Andrew Dominique Pambrun, was born a month later, on February 14, 1821. They were married a second time on December 8, 1838, in St. James Catholic Church at Fort Vancouver, with their children in attendance. This wedding formalized their country marriage in the eyes of the church. Kitty was baptized on the same day along with three of her children. When Kitty married Pierre, he had already worked as a clerk at various Hudson’s Bay Company posts throughout Western Canada. 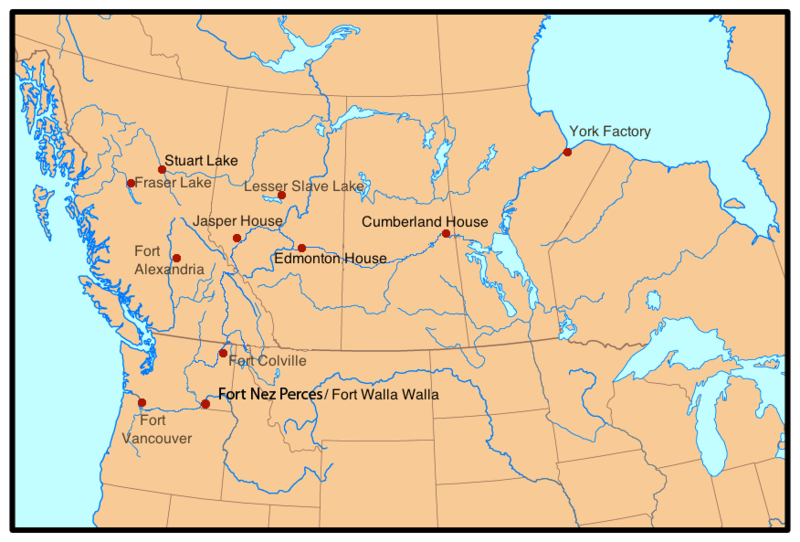 Pierre’s job required an enormous amount of mobility from Kitty and their children, taking them from Cumberland House in Saskatchewan to Edmonton in present-day Alberta (550 miles), then Stuart Lake in British Columbia (550 mi), and on to the Columbia region (another 850 mi) and Fort Walla Walla. By 1832, when Pierre was assigned to clerk at Fort Nez Perces/Walla Walla, Kitty and Pierre had five children, each born at different HBC posts. In 1836, while living at Fort Walla Walla, Kitty met Narcissa Whitman. Narcissa gave Kitty English lessons, and Kitty in turn served as Narcissa’s midwife when Alice Clarissa Whitman was born on March 14, 1837. In 1839, Pierre was promoted to Chief Trader of Fort Walla Walla, one of the few French-Canadians to reach that station. He and Kitty had four more children; their last child, Sarah, was born in April 1841, less than a month before Pierre was killed in a horse accident. There is no evidence that Kitty remarried after Pierre’s death, though she appears to have moved back to Fort Vancouver, applying there to receive his pension in 1843 as a widow. Their daughter Sarah died there in 1844 at the age of two. In June 1848, at Fort Vancouver, Kitty was confirmed in the Catholic faith alongside three of her daughters and one son. The 1850 census lists Kitty as living in Oregon City with her youngest children, but by 1860 she moved in with her daughter Maria’s family. In 1880, Kitty lived with her daughter Harriet’s family in West Chehalem, Yamhill, Oregon. 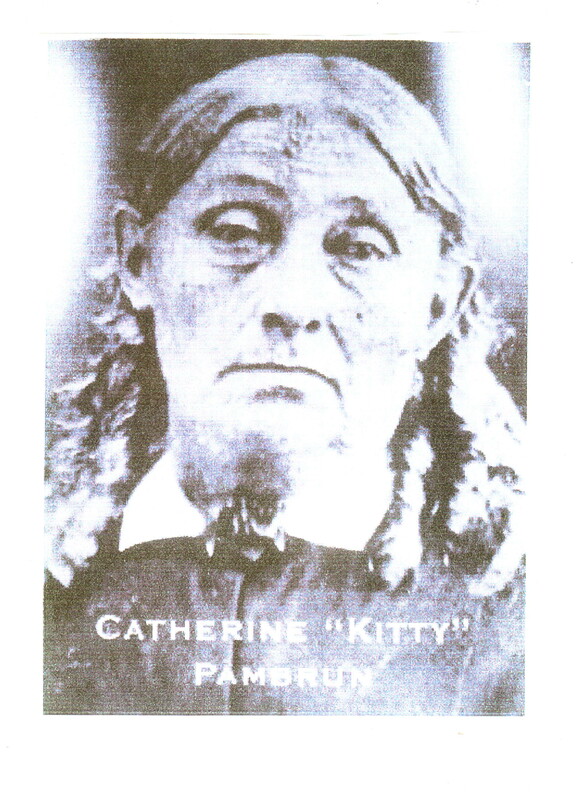 Kitty died on September 18, 1886 and was buried in Noble Cemetery in Newberg, Oregon. Sylvia Van Kirk, Many Tender Ties: Women in Fur-Trade Society, 1670-1870, (Norman: University of Oklahoma Press, 1983), 97; Also, Sam Pambrun, “Pambrun Genealogy for Frenchtown Website 2015,” n.p. UK, British Army and Navy Birth, Marriage, and Death Records 1730-1960. (The National Archives of the UK; Kew, Surrey, England; War Office: Officers’ Birth Certificates, Wills and Personal Papers. LOYAL AMERICAN AND CANADIAN CORPS; Class: WO 42; Piece: 062; Piece Description: Piece 062: M – R (1776-1881)). Harriet Duncan Munnick, Catholic Church Records of the Pacific Northwest: Vancouver Volumes I and II and Stellamaris Mission; Vancouver I, P.18, M 14 Pierre Chrysologue Pambrun and Catherine Humpherville; P.17, B 182 Catherine Humpherville. All information in this paragraph comes from Sam Pambrun, “Pambrun Genealogy for Frenchtown Website 2015,” n.p. Theodore Stern, Chiefs and Change in the Oregon Country: Indian Relations at Fort Nez Percés, 1818-1855 Vol. 2 (Corvallis: Oregon State University Press, 1996), 15. Harriet Duncan Munnick, Catholic Church Records of the Pacific Northwest: Vancouver Volumes I and II and Stellamaris Mission; Vancouver II, P. 39, S 12 Sara Pambrun; P. 37, S 7 P.C. Pambrun. Oregon, Early Oregonians Index, 1800-1860, entry for Sarah Pambrun, accessed May 30, 2017, https://secure.sos.state.or.us/prs/profile.do?ancRecordNumber=50980. See 1850 US Federal Census Census Place: Oregon City, Clackamas, Oregon Territory; Roll: M432_742; Page: 27A; Image: 56; 1860 US Federal Census, Census Place: Oregon City, Clackamas, Oregon; Roll: M653_1055; Page: 67; Image: 140; Family History Library Film: 805055; 1880 US Federal Census, Census Place: West Chehalem, Yamhill, Oregon; Roll: 1084; Family History Film: 1255084; Page: 399D; Enumeration District: 132; Image: 0802. Early Oregonians Index, 1800-1860, entry for Humperville, Catherine, accessed May 30, 2017, https://secure.sos.state.or.us/prs/profile.do?ancRecordNumber=7807.